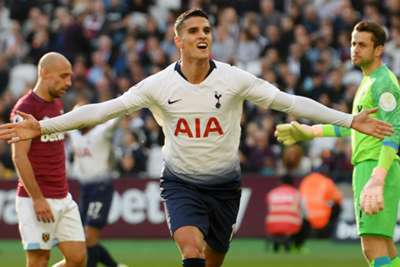 Spurs ran out 1-0 victors at the London Stadium thanks to Lamela's neat header at the end of the first half, but it was his all-round performance that pleased Pochettino. Lamela has had torrid luck with injuries since joining Spurs from Roma in 2013, but Saturday's winner was his 10th goal involvement – seven goals and three assists – in his last nine appearances across all competitions. "The form of the players sometimes change, it is difficult to explain," Pochettino told reporters in his post-match news conference. "We believe in him [Lamela], trust in him. He is more mature every year, more relaxed, calmer. He now needs to be consistent. "He's had a lot of injuries. Last season was tough for him, but with patience, belief and care for the player – that is the most important. "I don't like to talk about individuals too much, but he was fantastic [against West Ham]. The idea was to frustrate them. "Lamela was good, [which is] fantastic for him and his belief, and it was three very important points ahead of a tough period we have." Lamela's goal came after some good play by Moussa Sissoko on the left, as he cut in from the right and found the Argentina international with a left-footed cross. "He is a very professional player and has been a big part of the squad," Pochettino added. "I think Moussa provides balance and I am happy that the fans have started to see him like a player that helps the team and the club."